This page contains a character guide for Batman in Injustice 2. Here you’ll find movelists, combos, juggles and strategy guides and recommended gear for the Hero character. For more Injustice 2 content, head over to our Injustice 2 top page. After watching his parents gunned down before his eyes, young Bruce Wayne swore to exact vengeance on the criminal element, disguised as a fearsome creature of the night – Batman. Though only a mere mortal when compared to the godlike superhuman beings that litter the Injustice universe, Batman is still one of the most dangerous men alive. Having honed his body to near perfection, mastered almost every martial arts style known, and trained his mind to solve any problem, Batman is more than capable of holding his own against genuine superhumans and aliens through cunning wit and advanced weaponry. The Meter Burn version has Batman stop just short of his still reeling enemy. The Meter Burn version causes Batman to slam his opponent down and for them to bounce. The Meter Burn version causes it to explode. The Meter Burn version adds an exploding Batarang after the kick. Batman summons Mechanical Bats that hover around his body. Pressing ○ will unleash Mechanical Bats at the opponent as a projectile. Mechanical Bats can be released while Batman is in the air. Below are combo and juggle inputs for Batman , including corner strategies and restarts. Batman for the most part is a well-balanced character in Injustice 2. He doesn’t have a lot of defining characteristics in terms of moves, and is good for both beginner and veteran characters for his simple moves and combos. 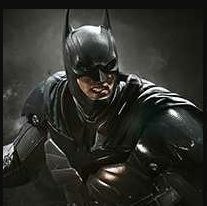 Under a very competent player, Batman is able to adjust to almost any character in the game. The secret to mastering Batman is having a definite understanding of his Combo Attacks and to have the proper timing to utilize his Special Moves and Character Power. Though Batman is a very simple and basic character, to a person that has mastered his move list, he can become a very complex character to play with and a very terrifying character to play against. It is highly advised to spend time in training if you would like to master Batman and take note of the different combo attacks that he has. In addition, it is best to take note of his Special Moves and Character Power as it is one of the highlights that further extend his combos to be more deadlier and consistent. He wears a dark metallic suit with a bat symbol spread across his chest. He has metal gauntlets on his wrists with fins on the outer sides. He has knee-high greaves and a cape with a unique spiked pattern at the bottom. He wears a black cowl designed with bat ears at all times and a yellow utility belt with the bat symbol on the buckle. He has a more armored batsuit with a ragged cape. He retains the bat symbol spread across his chest. He sports a modified utility belt with the symbol of Nightwing on the buckle and the fins on his gauntlets are smaller. His cowl is larger and covers more of his face. The Cowl in noticeably weathered and has a few small tears around his neck and cheeks. He is voiced by Kevin Conroy, Batman’s voice actor from the DC Animated Universe and many other works. He had his super move completely changed before the release of the game due to lackluster reception from fans. His original move was a parry attack, followed by several blows to the opponent and the use of his batclaw to hang the opponent for a final jump kick.